Problems are a part of life but how soon you want to get rid of them is your sole responsibility. Nothing is perfect and so are we. This is a true fact of life and as soon as we understand this, it will become easier for us to live a life that is full of happiness and peace. 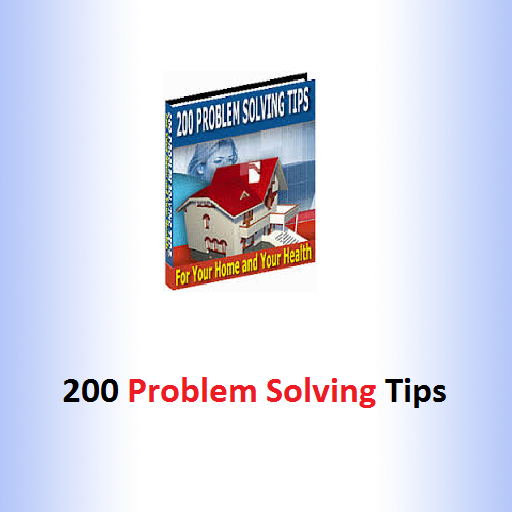 To help you with most of the common to severe health issues, money problems and home problems whether related to lifestyle or relationships, this app “200 problem solving tips for your home and your health” will be of great help. It is an app that will connect to you from internally and make you feel like there is solution to every problem in this world. This ebook has everything you wanted to know, try it out and you will say the same. And the best part of all, it is for free, easily available at GooglePlayStore and AmazonAppStore. 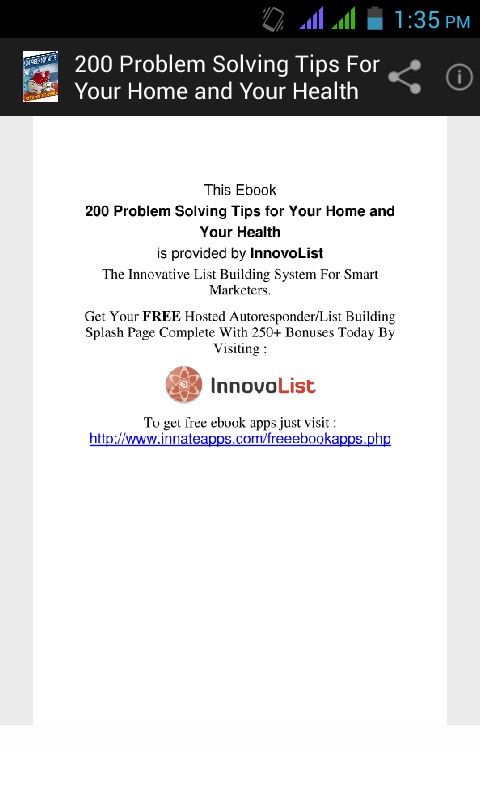 So, if you have been feeling down lately because of health issues or problems related to your home, don't forget to download this app because we're sure you would find several problem solving tips from among the whopping 200 expert tips in this app. Don't you think, any of your famil's health problem is a problem of the entire home. Even if one member in the house gets sick, other members get worried about his/her health. In such a situation, you might need quick advices and tips to get him recovered. 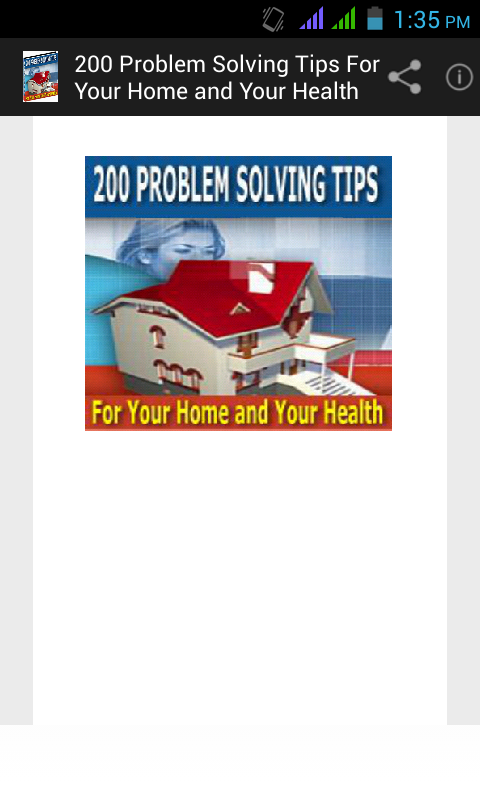 Our app has 200 problem solving tips among which some of vthe health issue solving tips are the most effective of all. Get it now on your phones to access to solutions whenever needed. •	Remove Broken Key From Lock : Put some super glue on broken off part, insert and hold a few seconds - will pull out rest of key. •	Remove Broken Light Bulb : Stick a bar of soap into jagged edges, use soap as handle. •	Remove Stubborn Screw : Heat with a soldering iron for a few seconds first. •	Protect Children From Sockets : Keep a piece of electrical tape over them when not in use. •	Good Glass Door Safety Tip : Put a BIG decal on those glass and patio doors. •	Keep Nails From Splitting Wood : Blunt sharp end of nail before you use by hitting with a hammer. •	Repair Small Holes In Screen : Plug holes with clear nail polish, let dry, repeat until filled. •	Straighten Warped Phono Records : Place record between two sheets of glass, set in sun for a while. •	Best Way To Clean Phono Records : Dip in solution of detergent and water, rinse and wipe dry. •	Make Your Own Fireplace Logs : Roll newspapers up tightly in shape of log. Papers are wood. •	How To Remove Oil From Driveway : Cover with sand, let stand a few days, then sweep off. •	Keep Fish Hooks From Rusting : Stick them in a cork and submerge in some baking soda. •	Make Sandpaper Last Longer : Back sandpaper with masking tape. •	How To Revive Old Razor Blades : Rub them back and forth inside of a drinking glass. •	Where To Sell Box Tops And Labels : Eggleston Enterprises, 207, Main Street, Milford, NY 13807. •	Remove Labels From Bottles & Jars : Fill with hot water and then submerge in hot water, will just fall off. •	Cut Glass Without Glass Cutter : Use tin snips and cut under water, smooth rough edges with sandpaper. 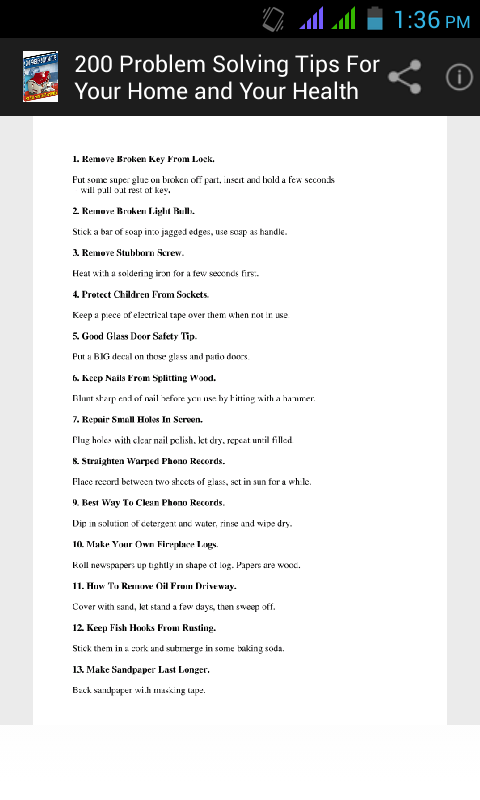 •	Easy To Unglue Stamps & Envelopes : Put in freezer a few hours then flip off with knife blade. •	Get Water Out Of Your Watch : Strap watch to light bulb, turn on for a few minutes. Water drops will form on crystals, open up and wipe off. •	Prevent Snow Sticking To Shovel : Coat shovel with car wax. •	Tighten Your Hammer Handle : Soak in used engine oil for a day. •	Low Cost Laminating- EASY : Cover article with clear contact paper. Works perfectly! •	Open That Stuck Zipper : Spray that stuck zipper with shaving foam. •	Remove Tar & Paint From Auto : The product to clean paint from your car is BENZOL. •	Increase Your Mileage : Put 4oz of benzol to each ten gallon of gasoline to incr. mpg.